A new poll out from IWV reveals that 83% of voters do not believe in voting for a political candidate based on gender. 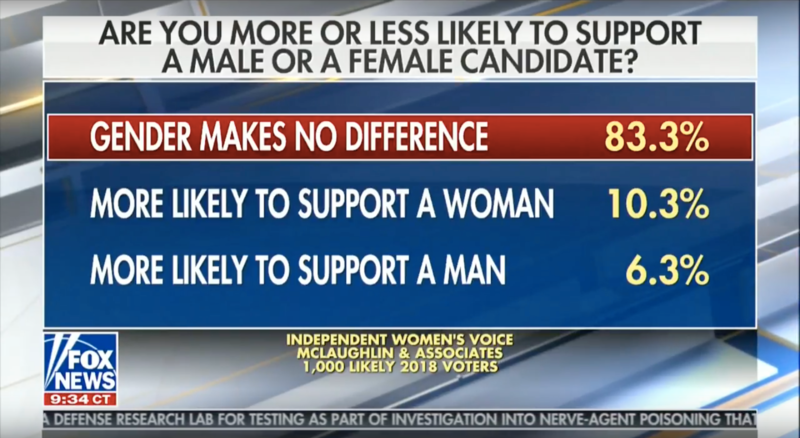 Laura Ingraham reported the results of the poll on her Fox News show last night, pointing out that it's ridiculous to call this the "year of the woman" because this poll proves that's not how people will vote. While a record number of women are running for office in 2018, most people (85 percent overall, including 84% of women) say candidate gender is not a determining factor when it comes to how they would cast their vote in the midterms. As our Champion Women Ambassador Harmeet Dhillion pointed out in the segment, American businesses are thriving right now. She also noted that if Americans had really been concerned with electing women, they would have done so in 2016. "The year of the woman was 2016 -- it didn't work very well for the Democrats. They tried to use Democrats to catapult an otherwise bad candidate across the finish line and it didn't work," said Dhillon. We certainly celebrate women running for office, but it's great to see the rejection of identity politics as a determining factor for one's candidacy.